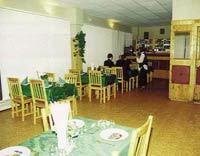 The three-star Hanza Hotel (3 floors, 12 rooms) is located in the heart of the city close to the Volga river embankment. The city administration, the Philharmonic Hall, the Opera and Ballet Theatre are not far from the hotel. Airport - 1 hour. Railway station - 15 minutes. Rossia has modern rooms for one or two persons decorated with comfortable and nice furniture. In all-convenient rooms you can have at one's disposal TV set, refrigerator, telephone. And a beautiful view to the Volga river you can have from every room in any season. Room prices includes: breakfast, newspaper delivery, mineral water, shoes cleaning, using an iron, shower cap, shower packet, individual clothes packet, shampoo, soap, toilet paper, individual sewing set. In de Luxes and extra-Luxes you can have a double dressing-gown. Silence, comfortable and nice furniture, cozy lounges will provide you a good rest. Tourist services: packet-tour (2 days/3 nights), packet-tour (5 days/4 nights), transfer, guide, interpreter. THIS PROGRAM IS THE SOLE PROPERTY OF HOTELS IN UKRAINE AND MAY NOT BE COPIED IN ANY WAY OR FORM WITHOUT EXPRESS PERMISSION FROM HOTELS IN UKRAINE.